The Sawfly was common in Massachusetts in 1796. It was first recorded in Europe in 1740. Life cycle: Only one generation per year. They develop in cocoons in the soil during the winter. Feeding characteristics: This insect larvae will penetrate into the developing fruit, but rarely cause serious or extensive damage. 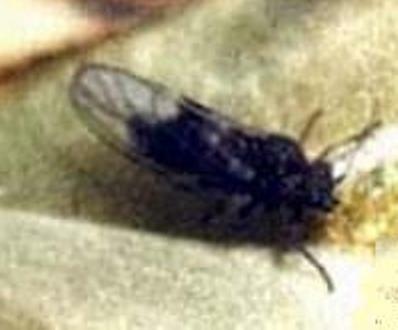 Physical description: This Sawfly is a little larger than the common housefly – and it has four wings -1/5 inch long and is brownish-black with yellowish wings. 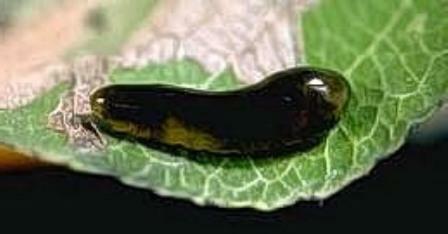 The pupa is 1/4 inches long and light yellow.